Discover all of the innovations here at SAS New Experience. 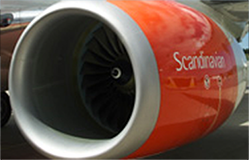 Every day, Scandinavia’s most experienced travelers are boarding our aircraft and resting in our lounges. They’re the reason we push ourselves to give more. And they’re why we will continue to do so in the future. Every innovation we create is from our travelers’ perspective. Their view of the world is our view. and rewarding as possible is in our DNA. In harmony with our travelers, we’ve upgraded our entire long-haul fleet – and now it’s time to turn our short-haul flights into greater experiences. Flying on SAS should always be about more than going from A to B. Rather, it’s a place to be, a place to work and a place to enjoy in every way imagined by travelers. We are proud to present the Airbus A320neo to our travelers on short-haul flights. Quieter than ever before and lit with mood lights, the cabins of Neo give you a superior experience to the classic Airbus planes. With its bigger engines and sharklet wingtips, Neo is also the most environmentally-friendly choice on these distances, using 15-20 % less fuel than other aircraft today. Welcome onboard. SAS is upgrading its entire short- and medium-haul fleet of 100 planes. The upgrade includes the replacement of 30 of these planes with the A320neo, the most efficient and environmentally-friendly aircraft in short- and middle-range traffic. The A320neo burns 15-20% less fuel per flight compared to the aircraft used today and will therefore help SAS achieve its sustainability goals. During 2017, it will also be fitted with Europe's fastest onboard WiFi. Follow the progress of the fleet upgrade here. The A320neo the most efficient and environmentally-friendly aircraft in short- and middle-range travel. Click on a part of the plane to read more. The 2.4 meter-long Sharklets rises up from the wingtips providing a reduction in fuel consumption. 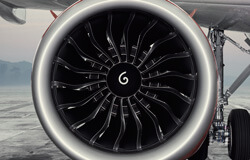 The CFM Leap 1A engines offer exceptional technical and environmental performance. A320neo burns 15-20% less fuel per flight compared to the aircraft used today. Here's the door to your second home. The new cabin features a new interior color scheme using soft grays with wood accents in a spacious cabin making your travel as comfortable as possible. The all-new cabin in the A320neo brings you extra legroom and more comfortable seats equipped with softer, lighter and more comfortable seat cushions. Each passenger seat is equipped with an easily accessible high power USB outlet and during 2017, all cabins will be fitted with Europe's fastest onboard WiFi. Not only do travelers enjoy extra space, the overhead compartments also hold more baggage than most of the current SAS aircraft and all of the cabins are also fitted with the innovative mood lighting that’s also used in our long-haul cabins. The light inside the cabin can be altered to create different atmospheres. For example, when serving food, the lighting is inspired by candlelight and when flying at night, the feeling of twilight in Scandinavia is created. There's a lot to tell about the newest aircraft in our fleet, so here we’ve collected all our stories and videos about the new Airbus A320neo. When SAS takes delivery of a new A320 neo two pilots put the plane through its paces before signing on the dotted line. In mid-October 2016 SAS was ready to take delivery of the first of 30 new A320neo planes as part of the upgrade of the short and medium haul fleet. But before that could happen two pilots – SAS Fleet Chief Pilot Ole Jørgen Jørgensen and Project Tech Pilot Ørjan Goteman – needed to make sure everything was in order. 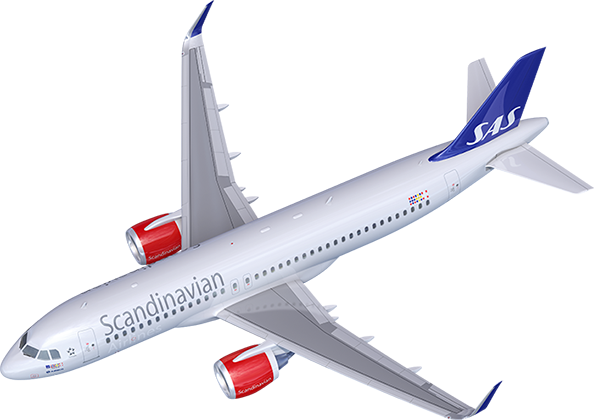 For 90 minutes Jørgensen made the first SAS A320neo acceptance flight in the skies over Hamburg, Germany. During the flight he made sure that the plane was behaving according to specifications, testing the radios, the data communications, the displays, the engines, and the landing systems. Once that he confirmed that everything was in order the papers were signed, the plane was bought, and it was all systems go. According to Project Tech Pilot Ørjan Goteman, who did the acceptance flight for the second A320neo to be delivered, acceptance flights are slightly less comprehensive than a test flight but they are no less important. “It’s a fixed manual we check against,” says Project Tech Pilot Ørjan Goteman. “In addition, we cherry pick aspects of the production test flight protocol that might have been a bit wonky. The flight envelope is inside the certified limits of the aircraft – but well outside the flight you would encounter on a passenger flight. Who are SAS’s test pilots? Career: Fell in love with planes when he was 5-years-old; 17 years in the Air Force, became certified test pilot at Edwards Air Force Base in California before becoming a commercial pilot. 20 years at SAS Flight Operations. Will return to flying regular flights before retiring in a few years. Career: Began career in the Air Force before training as a medical doctor and surgeon. Had to choose between medicine and flying. Chose flying. PhD in engineering. SAS training pilot and technical pilot, also does line flying. Once the pilots verify everything is in order they sign the papers, then fly the empty plane back to SAS homebase, where small modifications are made to give the aircraft the SAS flair. Jørgensen says SAS has been working on purchasing the A320 neo for a long time so the entire SAS Airbus office has been geared up and ready for the new planes to arrive. Pilots typically sit in their ‘office’ – the cockpit – around 8-9 hours a day, and often up to 13 hours a day. But while other planes have small, narrow, and not very comfortable cockpits, the Neo cockpit has a wider, roomier cockpit, a tray that can be pulled up for eating, and most importantly a quieter environment. In short, pilots say the A320neo is the best, most modern ‘office’ they could hope for. Passengers have also commented on the reduced noise. One thing that will continue to keep SAS moving into the future is the capability of the A320neo to make approaches on a curved path. Being a test pilot means you don’t just test new planes, though; pilots also test aircraft that have undergone heavy maintenance, such as changing out two engines. SAS has just 8-10 test pilots and becoming one takes a particular set of skills. Goteman and Jørgensen say the most important thing is the right attitude: you have to be capable of both getting into the details but also know when they’re not important – and you need the ability to cope in situations without full support, which means you do the best you can while getting on with the main objective. 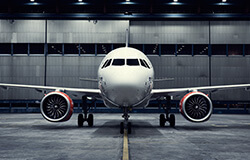 SAS will take delivery of 30 A320 neos over the next several years and Goteman and Jørgensen will be on hand to make sure everything is in order before flying the planes to homebase. The two men love what they do and seem to perfectly compliment one another. Between October 2016 and 2019, a total of 30 new A320neos will join the SAS fleet. Here, you can see the aircraft that have already been delivered and track those that are due to arrive soon. Click on an aircraft for more information and to see where it is right now. Dining at the speed of 850 km/h is quite extreme and space is limited. But the experience of being restored and refreshed doesn’t have to be. Introducing our new food and beverage concept on short-haul flights, a new handy way to eat on an airplane. Food made with fresh local and seasonal ingredients originating from the country where the plane takes off, served in a concept easy to hack to your own liking. At the core of the new food & beverage concept is the Cube. The inspiration comes from Scandinavian heritage and nature, with illustrations inspired by Scandinavian scenery. The exterior of the Cube is a soothing white, with calming graphic illustrations that reflect the Norwegian mountains, the Danish coast and the Swedish forests. 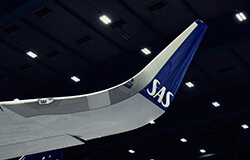 When the Cube is opened, the theme continues, giving a dynamic feeling to SAS’ Scandinavian heritage. When you lift the lid, the Scandinavian theme continues to unfold. Self-contained layers are revealed: the first thing you see is menu card, then the cutlery, which is embedded in the lid, then the condiments. All of the packaging has a fresh design that celebrates Scandinavian heritage and design. The Cube is both practical and premium – and opening it is a bit like unveiling a brand-new mobile phone or a box of premium chocolates. Beneath the layers of the newly designed menu, condiments, and cutlery is the main meal featuring local ingredients that reflect the seasons. Warm side dishes are served separately as is dessert, giving travelers more options to hack the meal their way and also cutting down on waste. And when you’ve finished eating? You simply slip everything back into the Cube and tuck it under your seat or to the side. The traveler is now in control. Strengthening Scandinavian origins and finding inspiration in Scandinavian nature is at the heart of the new food & beverage concept. The SAS design team has worked closely with SAS Head Chef Peter Lawrance to develop a concept that marries both the design and the food being served. Working with clean, simple cubist shapes and nature graphics in a beautiful blue tint strongly reflects SAS’ Scandinavian heritage. From the micro perspective used in the menu, you can almost feel and smell the nature, while the macro perspective used for the Cube lets the food take center stage. Welcome to the new SAS food experience. The new SAS food & beverage concept puts the focus on the finest and freshest local ingredients flavors, perfectly reflecting the SAS New Experience. SAS Head Chef Peter Lawrance has developed a rotating set of menus that are based on Nordic produce and seasonal ingredients, with New Nordic cuisine being a strong inspiration. New breads that are a cross between bread and a scone are filled with Scandinavian flavors, such as mushrooms and pine, and are matched to the main meals, such as Norwegian salmon smoked at Grisslehamn or almond potato mayonnaise with Västerbotten cheese. The menus rotate several times a week and will change with the seasons, so while you will enjoy a salad featuring fresh asparagus from Gotland in the summer when the asparagus season ends, you’ll enjoy a new menu that uses only the freshest, most seasonal ingredients. SAS’ new food & beverage concept is revolutionizing the onboard dining experience – putting travelers in control. When the first part of SAS’ new food & beverage concept, snack & beverage, was introduced in March, it highlighted SAS’ continued commitment to the New Experience, improving onboard satisfaction, and keeping the focus on local Scandinavian producers – and signaled a freshness in thinking. A bag of Sweden’s Larssons Chips will tell you where the potatoes were grown. Speedy Tom Chocolate from Denmark will open your eyes to exciting new flavor combinations and Norway’s Ringi Apple Juice will make it clear that locally-pressed apples make a real taste difference. High-quality stronger beverages, such as Denmark’s Mikkeller Vodka, Sweden’s Mackmyra Whiskey and Norway’s Harahorn Gin, have also been added to the snack & beverage menu, while old favorites such as Coca-Cola remain. Onboard meals will no longer trap you in your seat – although you might not mind being stuck, because SAS’ new food & beverage concept is raising the bar when it comes to onboard dining. A project two years in the making, SAS’ new dining concept, New Nordic by SAS, is poised to change the experience of onboard meals. As ambassadors for the Nordic countries, SAS realized that des­pite big leaps forward in dining and healthy eating on the ground, not least the emergence of new Nordic cuisine, both the food and onboard dining experience had become lackluster. When SAS began working on its new food and drink concept, it looked closely at onboard circumstances – small spaces and close neighbors – and decided it was time to embrace the unique onboard envir­onment, rather than fight against it. The question was how to do it? The answer came in the shape of a cube. Inspiration for the Cube came from a number of areas including takeout food, which offers a great meal consumed in an easy one-hand experience. The concept also embraces consumers’ wish to personalize food with various condiments and sides that are offered separately. Another inspiration was the New Nordic Food Mani­festo (see interview with Claus Meyer). Most of all, the Cube is about relevance and serving food in the context of flying. “We’ve focused on quality and origin, but also functionality,” says Gustaf Öholm, Head of Onboard Products & Services. “It’s a high-quality product presented and served in a way that utilizes the work space while giving passengers more control. “Travelers want a Nordic experience rather than a generic one.” He and his team quickly realized that many frequent flyers saw their onboard meal as one of the drawbacks of travel rather than a highlight. Another complaint was that once a meal was served, travelers were trapped behind tray tables until cabin staff cleared them. Enter the Cube, which combines elegant, minimal design with locally-­­sourced, seasonal and sustainable food that adheres to the values of the New Nordic Food Manifesto. Each Cube contains the main meal, condiments and utensils. Additional warm side dishes and dessert are offered, but not automatically included, so there’s less waste. The Cube can be held in the hand like a takeout container, leaving the tray free. Inside, travelers will find free-range chicken from Sweden, salmon from Norway and organic yogurt from Denmark, for ­example. “As far as possible, we use Scandinavian suppliers but even when we source food from other countries such as Greece, it’s local, because we fly there,” says Öholm. When the meal is finished, the Cube can be reassembled so it takes up minimal space and travelers are free to use their tables. “Basically, it puts choice back into the traveler’s hands,” adds Malmberg. The journey is about to get even more enjoyable for our 29 million travelers on short-haul flights. The new cabins have the same interior design that has proved to be so popular on our long-haul aircraft. In addition, the seats will be equipped with comfort cushions, USB ports and high-speed WiFi, making short-haul flights feel even shorter. The new cabin on the short-haul fleet means that no matter where you fly – long or short, Airbus or Boeing – you will enjoy the same new experience every time you board an SAS aircraft. The new comfort cushions will be covered with breathable grey natural fabrics, while the fore and aft walls will be covered with a wooden ash décor and the SAS logo up front. The carpets will be a warm gray, and fluorescent lights will be replaced with LED bulbs, which will warm up slowly and cast a soothing light. High-speed WiFi will be installed, as will high-powered USB ports at every seat. The entire retrofit, which has already begun, will be completed in 2019. A cabin upgrade is a complex undertaking. Read more for further details on how it happens. For the millions of travelers flying short-haul each year, the onboard experience is about to go to a whole new level of comfort. Follow the progress as SAS retrofits 66 aircraft in the short-haul fleet between 2017-2019. Follow the progress as SAS retrofits 66 aircraft in the short-haul fleet between 2017-2019. Click on a plane to find out more and see where it is right now. SAS is now installing WiFi onboard, which means you’re in for a new WiFi experience on most shorthaul flights within Scandinavia and Europe. From the moment you’re in the air to the moment you land you’ll enjoy fast and trouble-free WiFi, which means you can not only catch up on work emails or file that report, you can also shop, book a restaurant or activity, stream your favorite film, or binge-watch that TV show you just can’t get enough of. The SAS partnership with Netflix allows you to seamlessly stream your favorite Netflix originals, along with the enormous selection of other content you’ve come to expect from Netflix. Streaming onboard is just like at home: fast and trouble-free. This is your chance to catch up on hot properties like The Crown, Narcos and Stranger Things, or try one of Netflix’s latest offerings, such as the hotly anticipated The Umbrella Academy. Connecting onboard is nearly as simple as connecting at home. You’ll know you’re on a WiFi flight by the sign to the right of the door as you board, and the SAS crew will also make an announcement at the start of your flight. Passengers in Plus, as well as EuroBonus Diamond, and Gold members, enjoy free access to Wi-fi onboard, while Go passengers pay EUR 4,90 for full access. Installation of the new high-speed WiFi is in great progress, with the first 50 shorthaul planes finished. To keep you updated, we’ll publish the progress here as new planes are finished. Installation on the rest of the shorthaul fleet is expected to be finished in the beginning of 2020. Each aircraft will undergo extensive testing and SAS won’t release WiFi on any aircraft until it is completely satisfied with the Internet connection. There's a lot to tell about the newest aircraft in our fleet, so here we’ve collected all our stories and videos about our new WiFi. The introduction of high-speed WiFi connectivity on SAS’ short-haul aircraft has been a resounding success, especially for business travelers, ­restless teenagers and soccer fans. SAS unveiled its first high-speed WiFi-enabled short-haul aircraft in May this year. Ahead of the launch, customer service capacity was geared up to help if any problems arose. But in the end, the customer-service team received very few calls or emails – and not because of any connection difficulties. According to recent surveys, 90% of travelers on short-haul European flights want to be able to use their own smartphone, 80% want to use tablets and 70% laptops. Travelers in SAS Plus as well as Euro-Bonus Diamond and Gold members enjoy free WiFi onboard. Those flying in SAS Go pay EUR 4,90 for full access. You’ll have enough speed to keep up with friends and in social media. On most flights, you’ll be able to start streaming as soon as you’re in the air. SAS’ high-speed WiFi enables travelers to do all the things they can do online at home. You can check and update social media, catch up on work emails, finish and send in reports, shop, book restaurant tables or find exciting activities at your destination. You can also stream movies, TV series or sports events in real time. This was a relief for soccer fans who were able to watch games from high in the sky during this summer’s World Cup. “When people realized they could watch the games onboard, many of them said: ‘Amazing. Wow! It’s so crazy that it actually works’. Not that many people had expected this,” Ingelhammar says. Being connected makes flying easier for business travelers, smartphone-addicted teenagers and families with restless children. And since most seats onboard the WiFi-enabled aircraft have USB ports, batteries need never run out. “We’ve launched internet access to enable travelers to make more use of their time,” Ingelhammar says. “And they’re doing exactly that. Our customers do the same things in the air as they do on the ground. They either do some work or relax with a movie. We’re also seeing many people buying an upgrade for their next flight and booking totally new trips while onboard. High-speed WiFi is now available on even more short-haul routes within the Nordic countries and on European routes. You will be able to see if your flight offers WiFi the moment you step inside the plane. “The cabin crew will make an announcement and there’s also a card in the pocket in the back of the seat in front of you containing information on how to get connected,” Ingelhammar says. SAS currently offers high-speed WiFI onboard 33 aircraft. And more are in the pipeline. “We’re already in the process of instaling WiFi on more aircraft and we expect most of our short-haul flights to have WiFi onboard by the beginning of 2020,” says Ingelhammar.